To this conclusion came the participants of the conference on “The role of NATO for Azerbaijan: a reforms instrument or guarantor of security? Lessons learned on the example of the Turkish membership” held on February 25, 2011 and organized by the Center for National and International Studies . Dr. Zehra Odyakmaz of Turkey, a well-known expert on NATO and professor of the Gazi University, former dean of the faculty of law, Rasim Musabeyov, a Member of Parliament, political scientis, Yashar Jafarli, a well-known military expert and Bakhtiyar Aslanbeyli delivered speeches during the conference. Participants of the conference had an exchange of views around the subject of the role of Turkey and Azerbaijan in NATO: external and internal factors and the role of NATO in the security of and reforms held in Azerbaijan. Leyla Aliyeva, the President of the Center for National and International Studies opened the conference and said that Azerbaijan is one of the first countries in the post soviet space that succeeded to banish the Soviet troops from its territory. “At that time Azerbaijan was playing a leading role in the region. Nevertheless, since 2000 this direction has weakened”, said Leyla Aliyeva. Then the floor was given to the guest speaker from Turkey Dr. Zehra Odyakmaz. 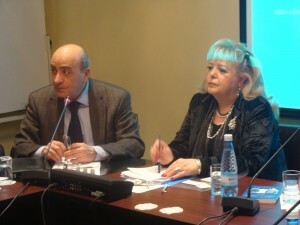 In her intervention Dr. Zehra Odyakmaz mentioned,”NATO is a type of security insurance for Turkey. NATO is the longest lasting one among the military agreements signed during the modern history. As the time changes, NATO also changes to conform to it. When the Soviet Union collapsed there were people thinking that there were no need for this institution anymore. Hence, they forgot that Russia which is a huge state possessing nuclear weapon was created instead. According to the perception of many states namely this is the source of danger”. Talking about the history of Turkey’s membership to NATO the Turkish guest said, “Before being accessed to this organization Turkey applied twice for membership and was rejected each time. Finally, in 1952 the NATO member-states decided to invite Turkey for membership”. MP and political scientist Rasim Musabeyov stressed, “NATO membership does not mean only security. Bulgaria, Hungary and other Eastern European states had 120-130 thousand armies prior to 90s. After NATO membership these figures reduced down to 20-30 thousand, nevertheless, their security has even strengthened.”. The Conference was dedicated to the 93rd anniversary of the establishment of the Azerbaijan Democartic Republic and financed by the National Endowment for Democracy (NED) .